^ a b c Eicher, pp. 155-56; Sauers, pp. 327-28; Warner, pp. 57-58; Wilson, np. ^ Eicher, pp. 155-56; Mierka, np. ; Warner, pp. 57-58. ^ Eicher, pp. 155-56; Mierka, np. ; Sauers, pp. 327-28; Warner, pp. 57-58. ^ Sauers, pp. 327-28; Wilson, np. ^ a b Wilson, np. ; Warner, p. 58; Sauers, p. 328. ^ Grimsley, p. 245, n. 43. ^ Esposito, text for map 120. ^ Wert, pp. 385-86; Mierka, np. ; Eicher, pp. 155-56. ^ a b Wilson, np. ; Eicher, p. 156. ^ a b Goolrick, p. 29. ^ Gods and Generals - Internet Movie Database. Catton, Bruce, Mr. Lincoln's Army, Doubleday and Company, 1951, ISBN 0-385-04310-4. Goolrick, William K., and the Editors of Time-Life Books, Rebels Resurgent: Fredericksburg to Chancellorsville, Time-Life Books, 1985, ISBN 0-8094-4748-7. Grimsley, Mark, And Keep Moving On: The Virginia Campaign, May-June 1864, University of Nebraska Press, 2002, ISBN 0-8032-2162-2. Mierka, Gregg A., Rhode Island's Own, MOLLUS biography. 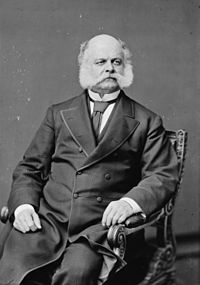 Sauers, Richard A., "Ambrose Everett Burnside", Encyclopedia of the American Civil War: A Political, Social, and Military History, Heidler, David S., and Heidler, Jeanne T., eds., W. W. Norton & Company, 2000, ISBN 0-393-04758-X. Wert, Jeffry D., The Sword of Lincoln: The Army of the Potomac, Simon & Schuster, 2005, ISBN 0-7432-2506-6. Wilson, James Grant, John Fiske and Stanley L. Klos, eds., Appleton's Cyclopedia of American Biography, D. Appleton & Co., 1887–1889 and 1999.